Great books need great readers; great readers need great books. But how to get the two together? 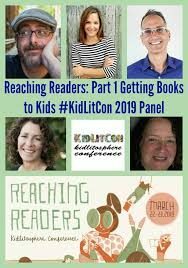 This panel of authors and professional publicists and book promoters talk about strategies they use to get books into the hands of gatekeepers (teachers, librarians, reviewers, booksellers, and family), and strategies that the gatekeepers can use to make the process of discovering the right books for their kids more effective. 4:15-6:00pm – Author meet and mingle. Books will be available for purchase & signing and speed critiques. at Hotel Providence in downtown Providence. The theme is Reaching Readers. KidLitCon is an annual gathering of people who care about, and/or blog (or Tweet or Instagram or Facebook or make Videos) about children’s and young adult books, including librarians, teachers, authors & illustrators (both published and aspiring), parents, guardians, and book reviewers. KidLitCon is a small, friendly conference, perfect for (often) introverted book lovers. Attending is a great way to turn virtual blogging friends into real world friends. Past conference topics have ranged from conquering the blogging blahs to learning to podcast to ways to support diverse books.